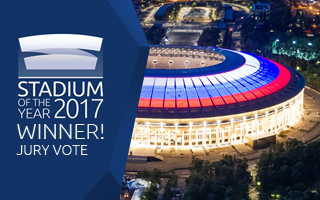 Stadium of the Year 2017: Jury Award winner – Luzhniki! One of just three stadiums to receive a note of 100% from any juror and the single only candidate this year to get average score of 75% of more in each category. It's a real pleasure to announce that Russia's national stadium and this year's World Cup opening and final venue becomes Stadium of the Year. Luzhniki is a project that may seem an odd selection at first, but at first only. From afar you can barely notice anything has changed. In fact, some of you may have not noticed that we've used an old photo of it in the graphic below. That's how consistent the new stadium is with what used to be here. After all, it was decided that the old outer shell, consisting of historical walls and more recent independent dome has to be retained. Inside, piece by piece, the old stands were demolished and completely new stadium built within the historical skin. Comparable only to the Brazilian Mineirao, Luzhniki presented a one-of-a-kind challenge, which was met brilliantly, making the transition between Olympic and football modes seamless. “The scale and historical importance of the Luzhniki Stadium gave a highly demanding challenge to the authors of its renovation project. 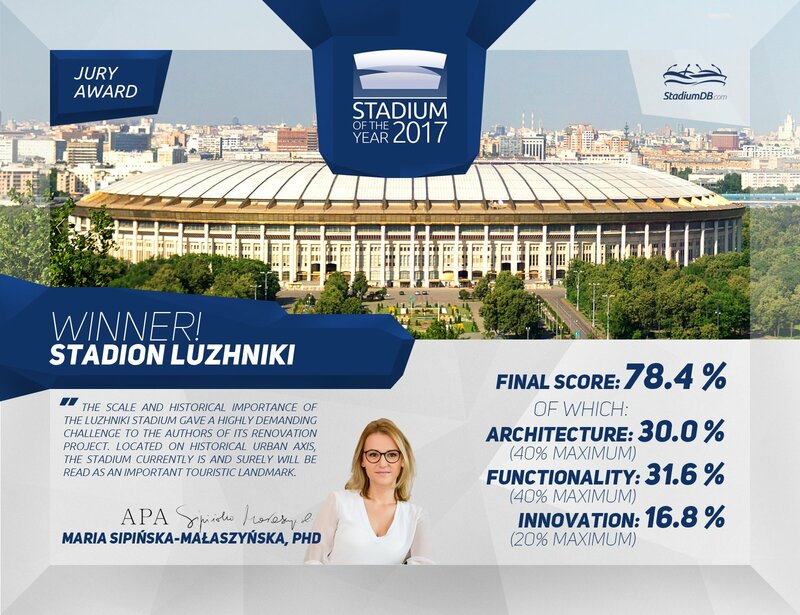 Located on historical urban axis, the stadium currently is and surely will be read as an important touristic landmark.” says Maria Sipińska-Małaszyńska, PhD, the only female member of this year's Jury. Indeed a landmark for all of Russia, Luzhniki is a brand new stadium inside, with much greater floor space built from scratch and stands able to accommodate over 80,000 people. With a traditional two-tier layout and a strip of skyboxes discretely hidden between, it gives a sense of being smaller than it actually is, cosier. And surely worth to bear the title of Stadium of the Year! Congratulations to all the companies involved, to name just SPeeCH, Mosinzhproekt and Metropolis, congratulations to the stadium operator and all of Russia!